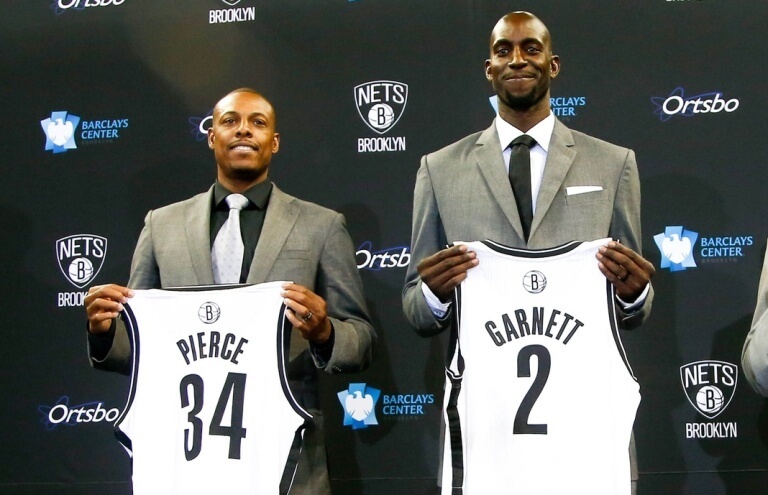 On June 27, 2013, the Nets and the Boston Celtics agreed in principle on a blockbuster trade (finalized July 12), dealing Kris Humphries, Gerald Wallace, MarShon Brooks, Keith Bogans (in a sign-and-trade), and Kris Joseph, along with three first-round draft picks (2014, 2016, 2018) and an option to swap the 2017 first-round pick, for Paul Pierce, Kevin Garnett, Jason Terry, and DJ White. This created a starting lineup that had a combined 35 All-Star appearances, with Deron Williams, Joe Johnson, Pierce, Garnett, and Brook Lopez together forming a new NBA “superteam”. The Nets also signed Alan Anderson, Shaun Livingston, All-Star Andrei Kirilenko, and first-round draft pick Mason Plumlee to add further depth to the bench. With all of its off-season moves, Brooklyn ended up with a league-high payroll of $102 million, in addition to having projected luxury tax payments totaling $86 million.